During our initial consultation, we assess the objectives of our patients and discuss the various treatment modalities for the restoration of the tooth/space in question. We also can determine whether we want to do this as a precision surgical guide keyhole surgery, which does not involve any incisions or suturing, or whether a conventional approach is required. Where the situation allows we look to place implants the day the tooth is taken out. We are able to do this in situations where the bone has not been destroyed by infection. Provided the implant is tight in the socket we are able to place a temporary crown on the implant the same day. No need for incisions, sutures and a quick fast procedure. Generally taking about 40 mins to an hour. If a temporary crown is placed, it is important that no pressure is applied to it during the healing phase as this can cause the failure of the bony connection (osseointegration). When there is infection or the bone is not adequate to predictably place an implant, the tooth is extracted and generally a graft is done at this time to maintain bone volume. We use a product called Bio Oss as our bone grafting material. This has been shown to be totally safe and effective. After healing for 3 months we take a new scan so we can use technology to virtually plan the implant prior to surgery. We then allow healing for a further 3 months prior to fabrication of the final crown. For front teeth we often have to fabricate a temporary crown to allow for the gum to grow around it to mimic a natural tooth so that we can predictably get an aesthetic result. This can take some months but in most cases we can recreate a similar gum shape as to what was there previously, prior to going to our final crown. For people who have had a tooth missing for a long time getting an aesthetic result can be challenging as the bone shrinks both horizontally and vertically. We can predictably rebuild the bone horizontally but vertically this still presents as a very difficult challenge. This can result in a restoration that looks too long. For people with a moderate to low lip this tends not to be an issue. However for those with a high lip line or gummy smile this is a very difficult obstacle to overcome. We therefore strongly advise people that early intervention with implant therapy is going to deliver a much more predictable, aesthetic and functional result and cost less! Here at Contemporary Smiles we have invested in the latest technology in the intra oral 3D scanner, The CEREC Omnicam and the XG3D cone beam CT xray scanner from Sirona, Germany. 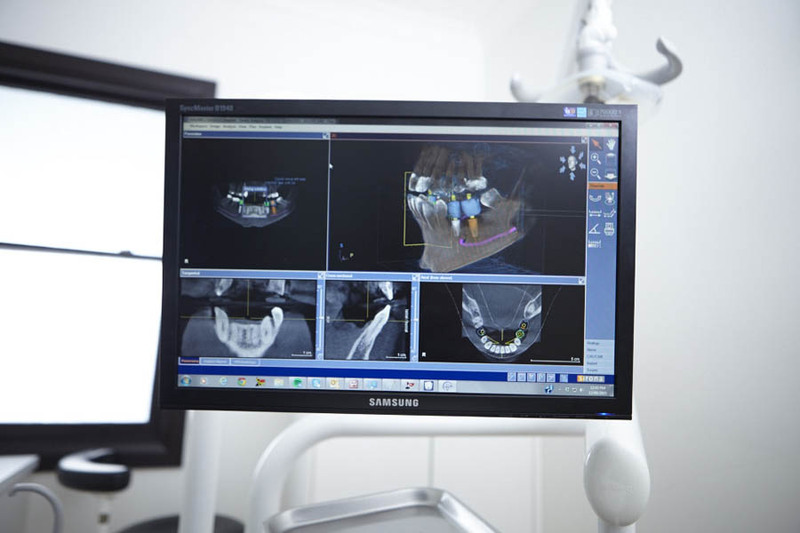 Once an implant has been decided upon, we take a cone beam CT scan at our practice, which gives a 3D radiographic (xray) image of the jaws and teeth. With the accurate fitting of the mouthguard we are able to place the implant with pinpoint precision without the need for any incisions or stitches. We regularly use guides for placement of implants where no grafting is required and often this is the case for back teeth. We like it as it has pinpoint accuracy and patients love it as it decreases treatment time and there is no need for incisions or sutures! Conventional implant surgery involves the reflection of the gum from the underlying bone to allow for visualisation of the bone during implant placement and also when a graft is required. We tend to prefer this type of approach for delayed implant placement for the front teeth as generally these require bone grafting. As we need to expose the underlying bone to do this the advantage of keyhole surgery is lost and we therefore don’t avail of the guided surgery in this instance. The ability to visualise the area tends to be more predictable in our experience when working in the front of the mouth. Bone Grafting is required when with the loss of the tooth, stimulation required for the maintenance of the bone height and width is lost and it therefore resorbs. This is a progressive process so the longer a tooth is missing the more likely it is, that a graft would be required to restore bone width and volume. This would happen either at the time of implant placement or in more extensive cases prior to implant placement.